Had to hit the hills, could be a while before I can get on the bike again. 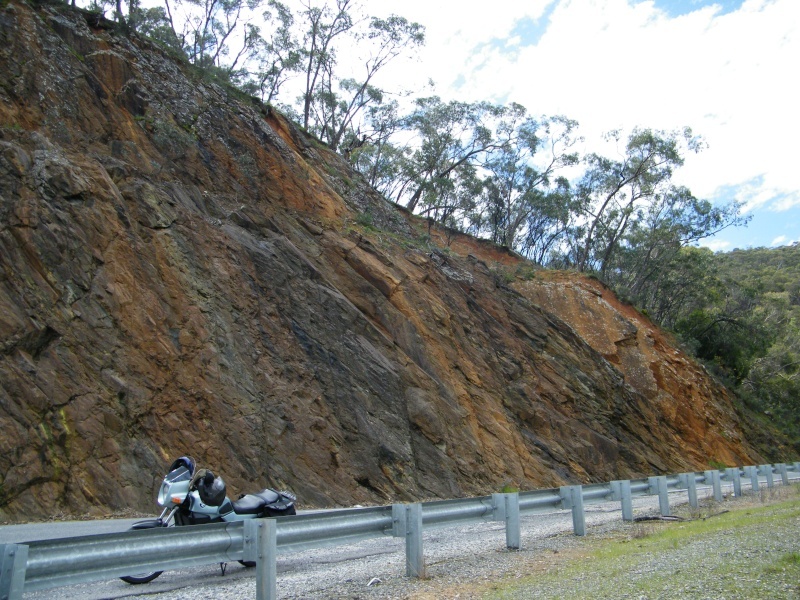 Part of the Gorge road, many cuttings like this, constant elevation changes with sweeping curves, near perfect surface ( has been for 30 plus years! No heavy transport?) Great camber, no "surprises". Me two up steady 80- 100 kph , oops I mean 70- 80! Sports bike riders? Modern bike ? 120 plus, oops, I mean 70 - 80! Top of the corkscrew, short sharp elevation rise 4 hairpins and same number nearly hairpins. Not the Stelvio by any stretch but that 1st gear one really settles you down, Ok, you win hill! and putter the rest of the way! Still a Hoot Ha Ha ! Couldn't get a good pic of the road, Google earth? Many of you guys like these, so do I when they are like this. Who knows what it is? As the sun sets I'm on my sisters' front lawn. Onkaparinga river oxbows just before the estuary. 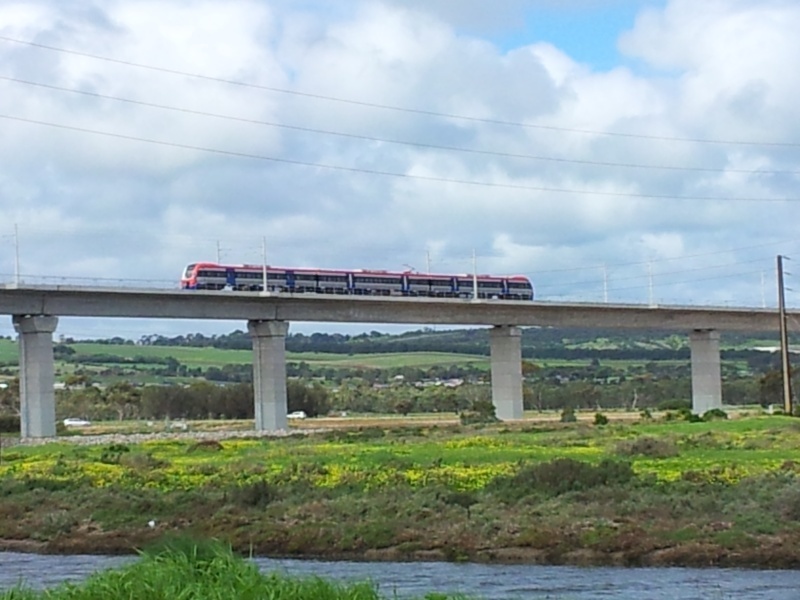 Visible is the new rail bridge over the river/wetlands. Longest "incrementally advanced" in the southern hemisphere, their claim. I saw this built/advanced. 1200metres abuttment to abuttment. 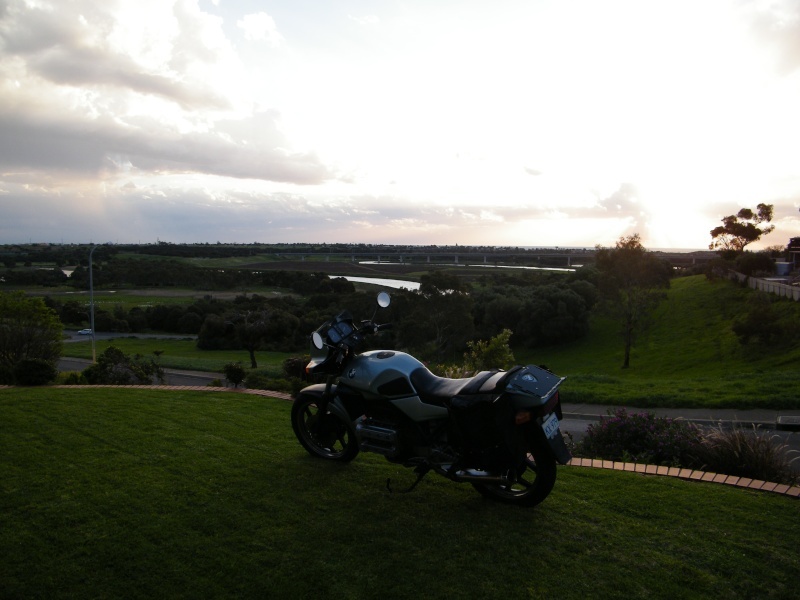 180 km day with socialising etc. Wet road start 9am, a little slip early so steady as then clear sunny sky but strong winds. Steady again getting used to a pillion. Coffee and more conversation, I met a guy i have been trying to catch for 12 months, we gabbed and gabbed 2 years ago, after Marco Simonchelli died, young Michael and I "cried " together for Marco. I feel an enormous bond to Michael even since not least because of my concern that he WAS Marco on public roads! Already badly bent up from an early smash and now he rides a ZX10, 2010 maybe, You know how they GO? So i meet him on the road yesterday, He's alive , my bond with him had worked, I'd "had his Back". Guess what? he's on his new V'Strom especially for his new partner Karen who is gorgeous, tho she still prefers the Ninja for the 140kph wheelies! I've exaggerated my part in this glimpse of his life, i'm just privileged to be witnessing it. The bond is bikes, how can this mechanical thing cross racial religious cultural generational boundaries? 1986 K 75 C 2nd owner 187,000kms showing . 1987 K100RT Police repainted, rough and unloved. 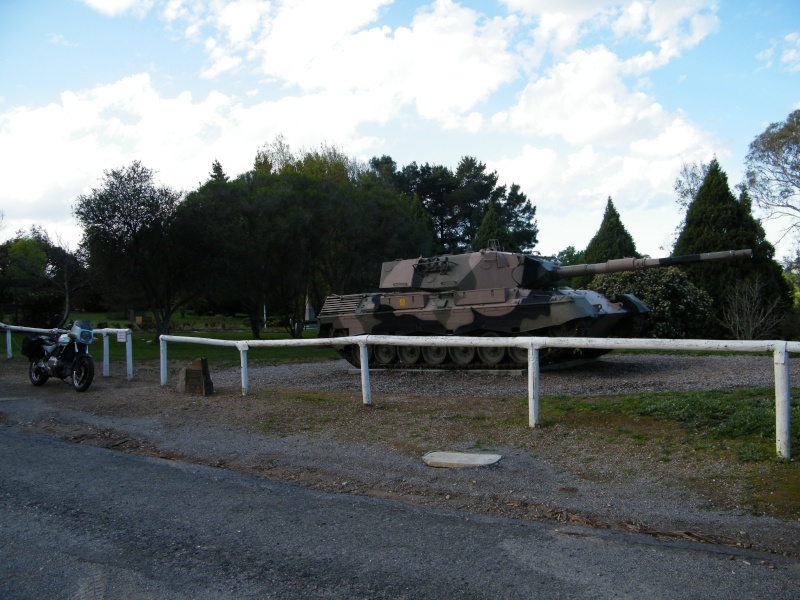 I was going to say it is a tank, but that would be to obvious so I will say a Leopard tank. Nice pics and good story. Written with feeling and care for the subject. Ta, Gordo. It's raining and coolish (14c) here in Fife, Washington. The annual US Pacific North Wet 'Rain Festival' is a month early. All I get now is a wet slog of a 50 km commute to work. No more sunny pleasure rides. It's good to see and read about riding back at home. 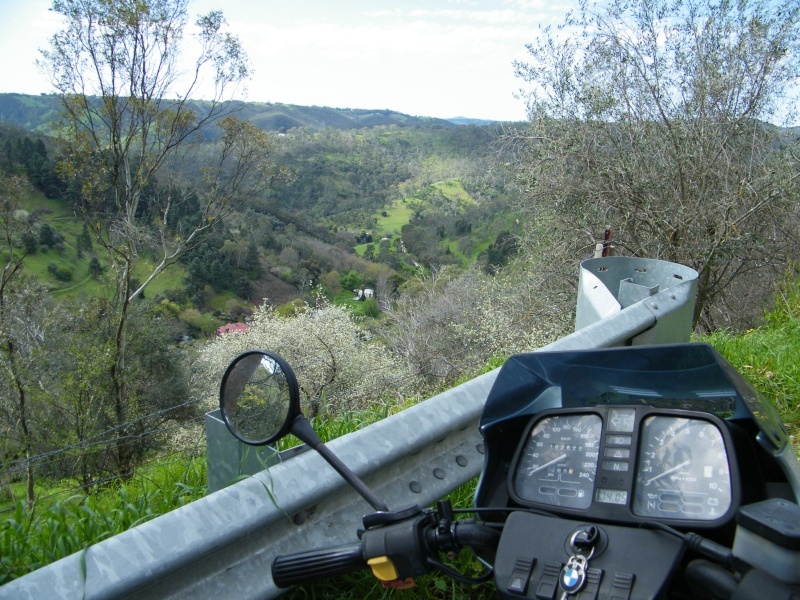 Nice roads and scenery Gordo, thanks for posting. "The world is a book and those who do not travel read only one page." - St. Augustine from 1600 years ago & still true! Bike: K100LT 1988. 0172363. AKA the Bullion Brick! Mods: k1100 screen and stands. K1: 1990. 6374189. Custom Stealth Black paint. » Any places to ride south of Wilmington?